WINNER of the NATIONAL BOOK AWARD and A NEW YORK TIMES TOP 10 BEST BOOK OF THE YEAR A finalist for the Kirkus Prize, Andrew Carnegie Medal, Aspen Words Literary Prize, and a New York Times bestseller, this majestic, stirring, and widely praised novel from two-time National Book Award winner Jesmyn Ward, the story of a family on a journey through rural Mississippi, is a “tour de force” (O, the Oprah Magazine) and a timeless work of fiction that is destined to become a classic.Jesmyn Ward’s historic second National Book Award–winner is “perfectly poised for the moment” (The New York Times), an intimate portrait of three generations of a family and an epic tale of hope and struggle. “Ward’s writing throbs with life, grief, and love… this book is the kind that makes you ache to return to it” (Buzzfeed). Jojo is thirteen years old and trying to understand what it means to be a man. He doesn’t lack in fathers to study, chief among them his Black grandfather, Pop. 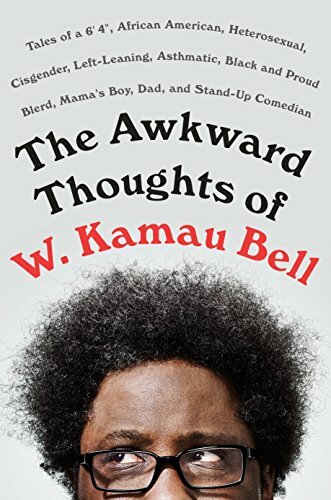 But there are other men who complicate his understanding: his absent White father, Michael, who is being released from prison; his absent White grandfather, Big Joseph, who won’t acknowledge his existence; and the memories of his dead uncle, Given, who died as a teenager. His mother, Leonie, is an inconsistent presence in his and his toddler sister’s lives. She is an imperfect mother in constant conflict with herself and those around her. She is Black and her children’s father is White. She wants to be a better mother but can’t put her children above her own needs, especially her drug use. 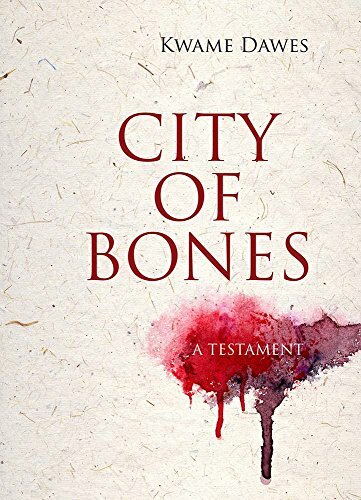 Simultaneously tormented and comforted by visions of her dead brother, which only come to her when she’s high, Leonie is embattled in ways that reflect the brutal reality of her circumstances. 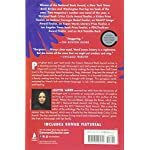 When the children’s father is released from prison, Leonie packs her kids and a friend into her car and drives north to the heart of Mississippi and Parchman Farm, the State Penitentiary. At Parchman, there is another thirteen-year-old boy, the ghost of a dead inmate who carries all of the ugly history of the South with him in his wandering. He too has something to teach Jojo about fathers and sons, about legacies, about violence, about love. 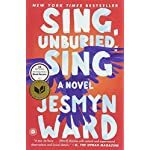 Rich with Ward’s distinctive, lyrical language, Sing, Unburied, Sing is a majestic and unforgettable family story and “an odyssey through rural Mississippi’s past and present” (The Philadelphia Inquirer). 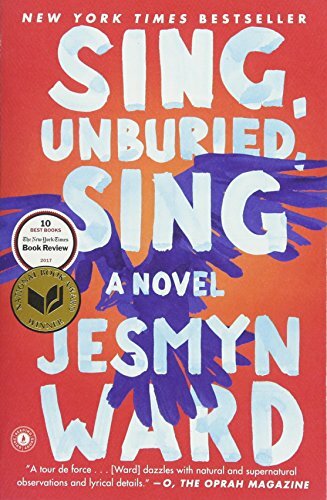 “[Sing, Unburied, Sing has] a fresh, visceral resonance … [its] story of grief, racism and poverty isn’t only Mississippi’s story but our country’s. So, too, let us hope, is its story of resilience and grace. 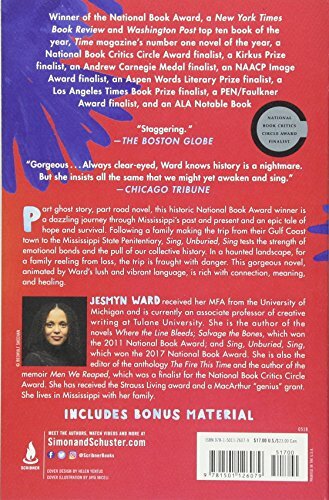 Jesmyn Ward received her MFA from the University of Michigan and has received the MacArthur Genius Grant, a Stegner Fellowship, a John and Renee Grisham Writers Residency, and the Strauss Living Prize. 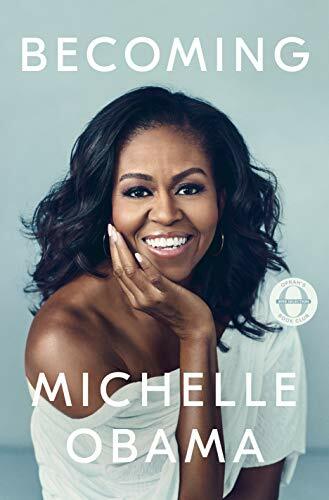 She is the winner of two National Book Awards for Fiction for Sing, Unburied, Sing (2017) and Salvage the Bones (2011). 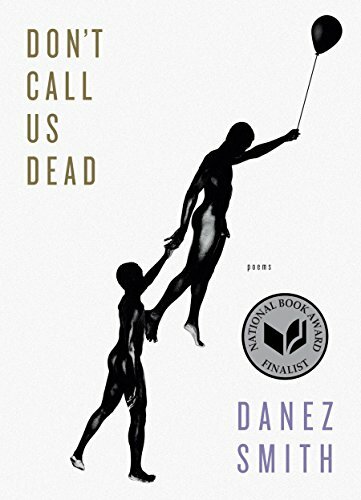 She is also the author of the novel Where the Line Bleeds and the memoir Men We Reaped, which was a finalist for the National Book Critics Circle Award and won the Chicago Tribune Heartland Prize and the Media for a Just Society Award. She is currently an associate professor of creative writing at Tulane University and lives in Mississippi.